We present a breakthrough in single-room ventilation area – supply and exhaust unit Micra 100 Wifi. This unit is a showcase of intelligent ventilation devices. This new unit, at first glance, attracts your attention by modern and simple design. Absence of any buttons and levers, a small size and a mirrored acrylic panel will allow you to integrate this device harmoniously into any interior. For local control the unit has a touch control panel with a pleasant blue backlight on its casing. The control system is one of the most important advantages of the new unit. There are several methods to regulate its operation. All methods allow you to turn the device on and off, to regulate air supply and exhaust speed, as well as to set up and to adjust weekly operation schedule. The first control method is the one mentioned above – touch control panel, which additionally indicates time for maintenance or any alarms occurred. The second method is a remote control. In addition to standard functions, it gives you a possibility to adjust air pre-heating and reheating in devices with heaters. The third control method is a highlight of Micra 100 Wifi – a wireless control with a help of a smartphone or a tablet via wifi. Through wifi several users can be connected to one device simultaneously. Micra 100 Wifi does not require complex installation works and connection of air duct systems. Air supply and exhaust are carried out directly through the unit. Supplied air is cleaned by panel filters G4 and F8. If you have stricter air purity requirements, F8 filter can be replaced with filters H13 or F8 Carbon. Due to special components, H13 filter delivers air purification of the highest degree, and F8 Carbon filter actively captures not only harmful contaminants but also bad smells. Exhaust air filtration is performed by panel filter G4. 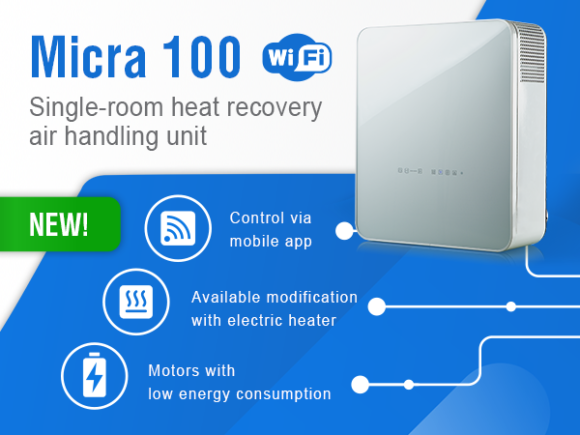 Micra 100 Wifi unit is one of the most energy efficient ventilation devices. First of all, the unit’s energy efficiency is achieved by a polystyrene heat exchanger, which during a ventilation process transfers exhausted air heat to supplied air stream, thus returning major share of thermal energy back to a room. Usage of heat exchangers in these units allows to reduce a load on heating systems during cold seasons. In summer, in the same manner the heat exchanger cools air and reduces a load on air conditioning system. For very hot, humid climates the unit can be equipped with an enthalpy heat exchanger. Another energy-efficient solution is a motor with low power consumption and a high level of efficiency. For cold climates the unit can be additionally equipped with specially developed built-in electric heater. If outdoor temperature is below zero, it is possible with this electric heater to heat supplied air to reach comfortable temperatures. Acoustic insulation provides additional comfort by ensuring unit’s silent operation. Vents engineers have proved once again that their enterprise has highest technologies and is able to generate plenty of brilliant ideas. Micra 100 Wifi unit makes single-room ventilation modern, simple and efficient. We expect to launch new Micra 200 Wifi with higher performance in the nearest future.